walk in interview on 30-10-2017. Venue details are given below. Application form for this Konkan railway Junior Technical Assistant Jobs is available in Konkan railway official website of www.konkanrailway.com. Preference will be given to the candidates who are having the knowledge of Auto CAD and MS Office Excel. Contract period for these vacancies is 2 years. More information is given below for this Konkan railway recruitment of Junior Technical Assistant recruitment. Venue is: KR Vihar, Konkan Railway Executive club, Sector-40, Seawoods-west, Navi Mumbai- 400706. 2. Jr Technical Assistant-Diploma in Electronics/Communications and one year work experience. Candidates will be selected based on their performance in interview and previous work experience. Candidates who are having necessary qualifications they can download application and fill the details, attach the supporting documents and attend the interview on 30-10-2017 along with original documents and a set of photo copies and 3 passport size photos. And also bring the age proof certificate, community, experience certificates. Attend the interview in a professional manner. Just attend the interview with a positive attitude. Reply the interviewer with a straightforward manner. Don’t get confused: if you don’t know the answer just say no. If you know the answers say it straightly. A good formal dress will give better appearance in interview. 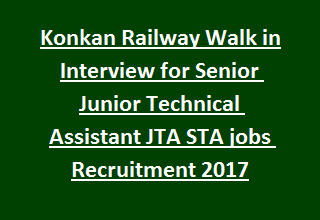 Download Application form and Notification here for Konkan Railway Senior/Junior Technical Assistant jobs.